Decision Making in Acetabulum Fractures – When to Operate and When Not to? Vol 3 | Issue 1 | Jan – Apr 2017 | page:6-9 | Raja Bhaskara Kanakeshwar, Ramesh Perumal, C Arun Kamal, J Dheenadhayalan. Ganga Hospital, Mettupalayam Road, Coimbatore, Tamil Nadu, India. not fit for surgery. Fluoroscopy under anesthesia to check for hip joint stability and percutaneous screw fixation are new upcoming management modalities. 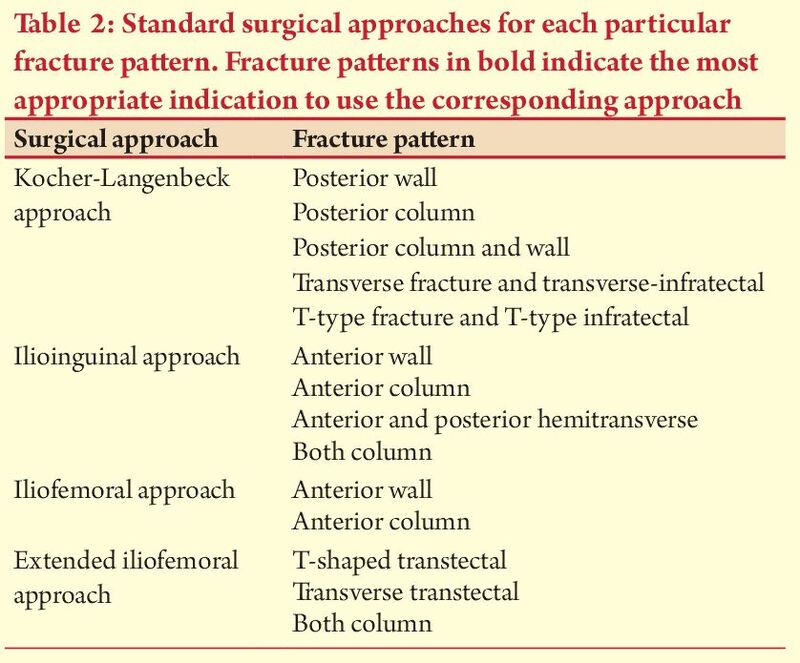 The approaches described by LeTournel and Judet – Kocher-Langenbeck, Ilioinguinal, Iliofemoral, and extended Iliofemoral – remain the “gold standard” for appropriate fractures, but the availability of newer alternative approaches have expanded over time thereby facilitating surgeons to operate better. Keywords: Acetabulum fracture, 3D computerized tomography, roof-arc angle, Kocher-Langenbeck approach. been tabulated to guide the treating surgeon. ‘ Good surgeons know how to operate, better ones when to operate, and the best when not to operate’. This famous saying applies right for all fractures including complex ones involving the acetabulum . High velocity road traffic accidents have frequently resulted in acetabulum fractures mostly involved with multiple fractures. In the 1950s and 1960s , both operative and non operative treatment regimens were purported to be the best and there was much confusion due to the unavailability of a comprehensive classification (1,2,3) . Landmark and meticulous work by Judet et al. provided clarity and gave recommendations for operative treatment based on their 10 year study following poor results from non-operative treatment (4). Contributions from LeTournel and Matta also threw light on the various indications when surgery was needed and how to manage these fractures (4,5) . The advent of 3- dimensional Computerised tomography ( CT ) allowed surgeons to understand the fracture pattern better and also plan the management better (5,6) . With the advances in imaging and surgical expertise , the increase in threshold for surgeons to operate and the advances in minimally invasive fixation techniques , non-operative treatment still forms the best treatment for particular fracture patterns and patient factors. No matter what method of treatment has been selected, obtaining an excellent long-term result in the treatment of acetabulum fractures depends on restoring a congruent and stable hip joint with an anatomically reduced articular surface of the femoral head . Understanding the anatomy of the innominate bone, defining the injury through radiographic assessment, and then determining a suitable treatment plan remains of utmost importance (4,7,8) .In the 1960s Judet after detailed studying of the acetabulum through dry models, advocated the need of two 45-dgree oblique views in addition to the standard AP view of the pelvis to study the anatomy of the fracture better . Since then these views are commonly used worldwide to assess any acetabulum fracture radiographically (4,7,8,9) . Advances in CT technology have not only improved the information provided by the two-dimensional images but also now offer useful three-dimensional images as well as computer-generated images which allow better understanding of the fractures(10-13) . C-arm image intensifier fluoroscopy has evolved nowadays and remains a method of intra-operative assessment regarding the stability of acetabular fractures (14). As of today, the ‘gold standard’ of imaging for the evaluation and assessment of acetabulum fractures includes plain x-rays involving a standard AP view of the pelvis , 45-degree oblique views (Judet views) and a plain CT scan with 3-dimensional images (4,13,14) . To attain the best results, stability and hip joint congruity must be accompanied by an anatomic (defined as less than 2 mm of displacement) reduction of the displaced articular surface. Therefore, accurate reduction of the intra-articular fracture fragments is critical for a successful outcome. After proper analysis of the fracture pattern and analysis by imaging, the decision to operate or conserve depends on multiple factors(15) . As a general rule, all stable concentrically reduced acetabular fractures which do not involve the superior acetabular dome can be considered for nonoperative treatment. Nonoperative management may also be chosen for patients with severe underlying medical problems that preclude surgery which mainly includes a small group of elderly patients. Patient-related factors such as age, preinjury activity level, functional demands, and medical comorbidities must be considered when determining whether a patient is best served by operative or nonoperative management(15,16). The indications for non-operative treatment have been discussed in Table 1 . Significance of the superior dome of the acetabulum :Rowe et al(11) first recognized the condition of the superior dome of the acetabulum to be one of the most significant prognostic indicators of a good clinical outcome. The superior dome of the acetabulum ( acetabular roof ) is defined as the superior third of the weight bearing area of the acetabulum. Study of axial CT sections by Olson and Matta(10) of the superior 10 mm of the acetabular articular surface are equivalent to the weight-bearing dome region of the acetabulum . These can be useful in determining if acetabular fracture lines involve this region. Controversy still exists regarding the exact amount of displacement that is considered acceptable when the superior dome is involved, but most authors recommend surgical intervention if displacement exceeds 2 mm(4,10,11) . Of the pioneering works done by Matta, one of the important studies involves proposing the roof arc angle measurements in acetabulum fractures . This measurement is of utmost significance as it helps to determine if the remaining intact acetabulum is sufficient to maintain a stable and congruous relationship with the head of the femur. Using this method, operative versus nonoperative treatment can be decided. The roof arc angle is measured on all three radiograph views without traction. The medial roof arc is measured on the AP view, the anterior roof arc is measured on the obturator oblique view, and the posterior roof arc is measured on the iliac oblique view. To calculate this measurement, the first line is a vertical line through the center of the femoral head and the second line is drawn from the center of the femoral head to the fracture location at the articular surface on the particular view. Roof arc measurements are not applicable to both-column fractures or those with a fracture of the posterior wall. The recommendations of the angles for non-operative treatment have been changing based on various biomechanical studies and have evolved with time . 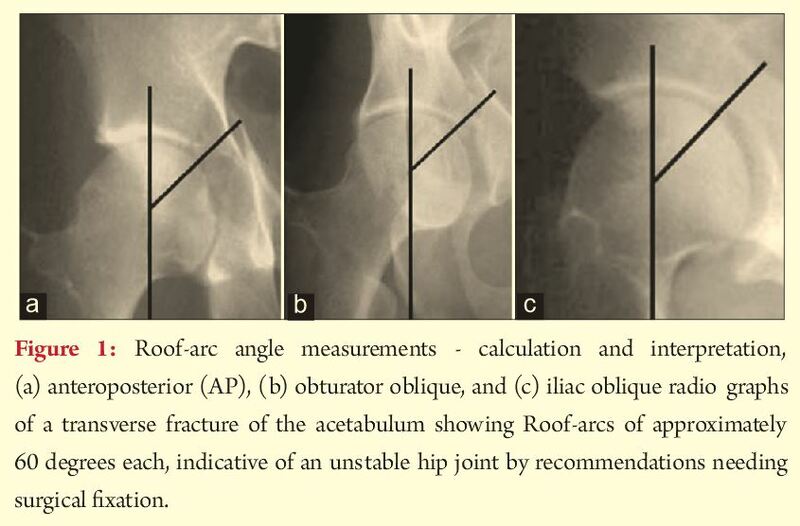 However current recommendations are fractures with a medial roof arc angle of greater than 45 degrees, an anterior roof arc angle of greater than 25 degrees, and a posterior roof arc angle of greater than 70 degrees have sufficient intact acetabulum for nonoperative management (4,11,13,15,16,17).However, the roof arc angle is not without limitations. It is not applicable to both column fractures and fractures of the posterior wall (16). Displaced both column fractures in the presence of secondary congruence especially in a young patient are amenable to non operative treatment . But it must always be remembered that fractures with secondary congruence do not have as good a prognosis as those managed with anatomic reduction. In cases of doubtful stability of the fractures ,dynamic fluoroscopic stress examination with the patient under anesthesia, is one proposed method of identifying fractures at risk(14). However, the exact technique for performing this examination has not been properly defined . When in doubt, it is always safe to assume that all these fractures are unstable until proved otherwise. For those patients who meet the criteria of non operative management treatment mainly consists of bed rest with joint mobilization with gradual progression to full weight bearing walking . Progressive weight bearing ambulation is started at about 6 weeks to 12 weeks when adequate fracture healing is seen on radiographs taken periodically(15) .Traction to the affected limb as a part of non operative treatment is controversial. Traction is only advised to patients with operative indications related to fracture displacement but not amenable to surgery due to their associated conditions(15,16) . Operative Treatment : Timing of Surgery :Classification of the fracture and subsequent preoperative planning are important and necessary aspects of the operative treatment process . After classifying the fracture based on the radiographs and the CT scan images , the plan for fixation includes the timing of surgery and the approach to be used . In general, the surgical treatment of an acetabular fracture is not an emergency. A 3 to 5 day delay is commonly used to allow for evaluation of any underlying medical issues or associated injuries and for meticulous preoperative planning( 18,19,20) . The time to surgery has been shown to be a significant predictor of radiologic and clinical outcome and, if possible, should not be delayed beyond 10 days for associated types and 15 days for elementary fractures(21). Recurrent hip dislocation following reduction, irreducible hip dislocation, progressive sciatic nerve deficit, associated vascular injury, open fractures and ipsilateral femoral neck fracture are indications for emergency acetabular fracture fixation(22) . Selection of the appropriate approach is one of the most important aspects of the preoperative planning for acetabulum fracture fixation . Fracture type, the elapsed time from injury to operative intervention, and the magnitude and location of maximal fracture displacement are the main determinants in the decision making(4,17,18) . The mainstay surgical approaches to the acetabulum are those described by Letournel and Judet: The Kocher–Langenbeck, the ilioinguinal, the iliofemoral, and the extended iliofemoral(4,18) . The first three approaches provide direct access to only one column of the acetabulum (posterior for Kocher–Langenbeck; anterior for ilioinguinal and iliofemoral) and require indirect manipulation for reduction of the fracture lines that traverse the opposite column. A sequential approach is then added if the single approach proves insufficient to accomplish reduction of the opposite column. The extended iliofemoral approach affords the opportunity for almost complete direct access to all aspects of the acetabulum and is mostly used for delayed treatment of an associated fracture type(20-22) . However, alternative approaches have been proposed and these include the modified Gibson approach, themodified Stoppa approach, the trochanteric flip osteotomy and a simultaneous combination of the standard anterior and posterior approaches(22) . 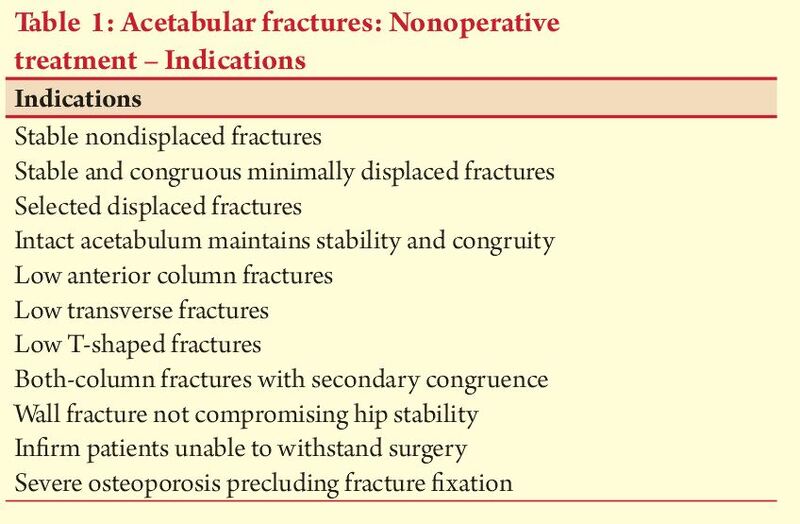 Appropriate approaches for the particular fracture types have been described below in the Table 2 . Although significant strides have been made in fracture fixation nowadays, acetabular fracture fixation surgery still remains an extensive surgery with a significant potential complication rate(1-5,17,22) . The results published by LeTournel and Judet in 1993 remain the ‘gold standard’ in the management of acetabulum fractures(4) . As per the current guidelines in the management of acetabulum fractures in order to make a decision the following are recommended by the authors :1) AP view of the pelvis and 45-degree oblique radiographs in association with 3D reconstruction CT images are the investigations of choice for evaluating an acetabulum fracture2) The involvement of the fracture dome and the roof arc angle measurements are important indicators to decide to operate and in achieving a good outcome3) Non displaced fractures and stable non displaced fractures can be treated non operatively . Those patients who are not amenable to surgery due to poor medical conditions can also be treated non operatively 4) Displaced fractures are best managed by open reduction and internal fixation by their appropriate approach and the anatomic congruency of the reduction determines the long term functional outcomeGood sound knowledge about the anatomy of the innominate bone , sharp and meticulous surgical skills, proper pre operative planning and performing surgery on patients with the right indications are factors which have stood the test of time and when practiced give good results to the patient and the operating surgeon . 1. Laird A, Keating JF. Acetabular fractures: A 16-year prospective epidemiological study. J Bone Joint Surg Br 2005;87:969-973. 2. Ferguson TA, Patel R, Bhandari M, Matta JM. Fractures of the acetabulum in patients aged 60 years and older: An epidemiological and radiological study. J Bone Joint Surg Br 2010;92:250-257. 3. al-Qahtani S, O’Connor G. Acetabular fractures before and after the introduction of seatbelt legislation. Can J Surg 1996;39(4):317-320. 4. Judet R, Judet J, Letournel E. Fractures of the acetabulum: Classification and surgical approaches for open reduction. Preliminary report. J Bone Joint Surg Am 1964;46:1615-1646. 5. Stewart MJ. Discussion of prognosis of fractures of the acetabulum. J Bone Joint Surg Am 1961;43A:59. 6. O’Toole RV, Cox G, Shanmuganathan K, Castillo RC, Turen CH, Sciadini MF, et al. Evaluation of computed tomography for determining the diagnosis of acetabular fractures. J Orthop Trauma 2010;24(5):284-290. 7. Borrelli J Jr, Peelle M, McFarland E, Evanoff B, Ricci WM. Computer-reconstructed radiographs are as good as plain radiographs for assessment of acetabular fractures. Am J Orthop (Belle Mead NJ) 2008;37(9):455-459. 8. Heeg M, Otter N, Klasen HJ. Anterior column fractures of the acetabulum. J Bone Joint Surg Br 1992;74(4):554-557. 9. Matta JM, Anderson LM, Epstein HC, Hendricks P. Fractures of the acetabulum. A retrospective analysis. Clin Orthop Relat Res 1986;205:230-240. 10. Olson SA, Matta JM. The computerized tomography subchondral arc: A new method of assessing acetabular articular continuity after fracture (a preliminary report). J Orthop Trauma 1993;7(5):402-413. 11. Rowe CR, Lowell JD. Prognosis of fractures of the acetabulum. J Bone Joint Surg Am 1961;43A:30-59. 12. Tile M, Helfet DL, Kellam JF. Fractures of the Pelvis and Acetabulum. Philadelphia, PA: Lippincott Williams & Wilkins; 2003. 13. Moed BR, Ajibade DA, Israel H. Computed tomography as a predictor of hip stability status in posterior wall fractures of the acetabulum. J Orthop Trauma 2009;23(1):7-15. 14. Parker PJ, Copeland C. Percutaneous fluoroscopic screw fixation of acetabular fractures. Injury 1997;28(9-10):597-600. 15. Tornetta P 3rd. Non-operative management of acetabular fractures. The use of dynamic stress views. J Bone Joint Surg Br 1999;81(1):67-70. 16. Helfet DL, Borrelli J Jr, DiPasquale T, Sanders R. Stabilization of acetabular fractures in elderly patients. J Bone Joint Surg Am 1992;74(5):753-765. 17. Spencer RF. Acetabular fractures in older patients. J Bone Joint Surg Br 1989;71B:774-776. 18. Moed BR. Acetabular fractures: Kocher-langenbeck approach. In: Wiss DA editor. Master Techniques in Orthopaedic Surgery: Fractures. 3rd ed. Philadelphia, PA: Lippincott Williams & Wilkins; 2012. p. 817-868. 19. Starr AJ, Watson JT, Reinert CM, Jones AL, Whitlock S, Griffin DR, et al. Complications following the ‘T extensile’ approach: A modified extensile approach for acetabular fracture surgery-report of forty-three patients. J OrthopTrauma 2002;16(8):535-542. 20. Vailas JC, Hurwitz S, Wiesel SW. Posterior acetabular fracture-dislocations: Fragment size, joint capsule, and stability. J Trauma 1989;29(11):1494-1496. 21. Wright R, Barrett K, Christie MJ, Johnson KD. Acetabular fractures: Long-term follow-up of open reduction and internal fixation. J Orthop Trauma 1994;8(5):397-403. How to Cite this article: Kanakeshwar RB, Perumal R, Kamal AC, Dheenadhayalan J. Decision Making in Acetabulum Fractures – When to Operate and When Not to? 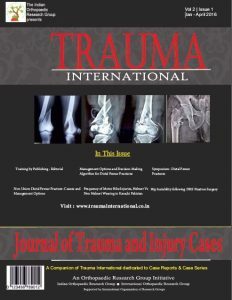 Trauma International Jan-Apr 2017;3(1):6-9.